No 1 Knit Top Down, More NaKniCromo and Calorie Free Doughnuts too! Busy few days. Inspired by https://shirleycyeung.wordpress.com/ amongst others I have started by first top down knitted item and I LOVE IT ! Having tried once before and failed badly, I choose small, a new baby project from Ravelry.com – All-In-One Sleeveless Baby Top (6 months) & (9 – 12 months) by marianna mel With a little help from a YouTube video on understanding construction I totally get it now. Here’s a little bit of my progress. It’s small but more projects going on at the same time. I have also finished another baby top – bottom up construction – needs a little steaming and a button, not as pleased with the button band as I should be, hopefully that will steam out a little. NaKniCromo on Ravelry.com – it’s take a lot of thinking about my dream project (Day 16) – not sure I have just one, just an image of several. I guess premium yarns, dreams to knit without hiccups, perhaps at least one repeat of an item knit a few years ago. Oh, and of course, the price of the wool would be irrelevant or it would have been free! Day 17 – Dream Tools – I favour Knit Pro Symfonie needles, rainbows even when knitting with boring yarn! Day 18 – Technique I would like to master – I would like to be more adventurous with cables, though at the moment I have so much I want to knit that I choose more simple patterns that seem a lot quicker than the fantastic complicated cables I drawl over. Day 19 – More Yarn or Less yarn – More yarn, always more yarn of course. I am working on reducing my stash, whether knitting it or selling some to buy more. Day 20 – Today – Favourite Tip or Trick – It’s ok to rip something back, don’t consider it wasted time, consider it a learning curve. Also, mattress stitch, once learned I have never gone back to running stitch or oversewing seams. And a little sewing – remember the last post – beige and pink circles with sewing pins. They turned into these doughnuts! And now they are available to purchase at a little lovely cafe, The Teashop at Downe, Kent. I hope customers popping by for a tea and cake will fancy taking a Calorie Free/Sugar Free cake home for later! So as you see, a busy few days here. This entry was posted in Uncategorized and tagged doughnuts, Downe, https://shirleycyeung.wordpress.com/, knit, marianna.mel, Naknicromo, Ravelry.com. How lovely, Tina! I’m so glad to read about your top-down project (thank you, very much, for the mention) :). That’s a wonderful pattern, and the yellow is so cheerful. The little white cardigan is very adorable; I would really like to try a pattern with the lovely round closure like that. Great doughnuts! I’ve never seen felt look so delicious! Thank you Shirley. I love the cheerfulness of the yellow too – though I had knitted more earlier today which I had to rip this evening as I didn’t realise I’d a twisted stitch. This might take a little longer than expected to finish! Good luck if you try a rounded edge top, I’ve made a couple in the past, both baby jackets. And yes, the doughnuts look good enough to eat, ha ha! those doughnuts look fun! 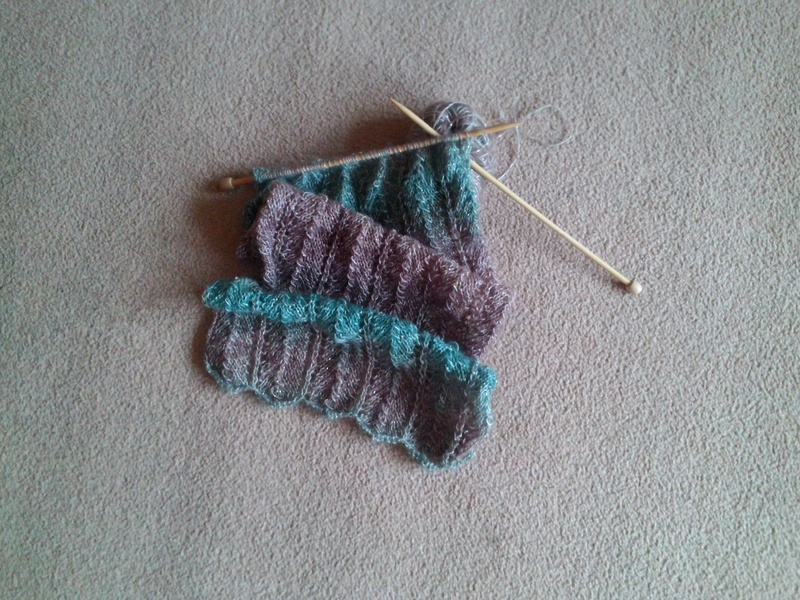 I am not a big knitter, but it seems as if things are going along smoothly! Yes they’ve been fun to make and look a treat ! Your doughnuts look great! I imagine no one can resist picking one up and squishing it. I’m a big top-down knitter. I have to really pay attention to the raglan increases because I don’t know how to fix a missed one if it’s a few rows down. I need to try bottom up one of these days. I hope the book you’re currently reading resonates with you in more ways. I understand how it is though. When I had read What I Told My Daughter, I found some great advice women in power have taught their daughters but most of the book was okay so I sped read through those parts. Thank you for your comment about the doughnuts and top down knitting – I think I might be inspired to knit bigger things in top down, but I, like you I guess, would be in a bother if I miscounted! Yes, I hope the book will hit the mark when I re-read it. I mentioned a little about it to my son today and his eyes glazed over! The doughnuts are gorgeous. I’m not much of a knitter, but I did sew from time to time. They are so cute. Are you selling them online too anywhere? Thank you. No I am not at the moment but I never say never! It might be something I do in the future, perhaps via Etsy. Thank you, tierneycreates. The baby top was well received by a new mum for a newborn just last week – though the top might not fit for a while!